UDM Downloads > Brilliant Database SDK! Brilliant Database SDK is a program that allows you to create a database without having any special knowledge or skills, and to compile it into an EXEcutable file. Brilliant DB allows you to easily maintain a database, which can contain information about personnel, customers, goods, important papers and more. With this program, you can create a database that works with completely different types of data. To accomplish these goals, the program consists of 6 powerful editors and the EXE compiler: 1. 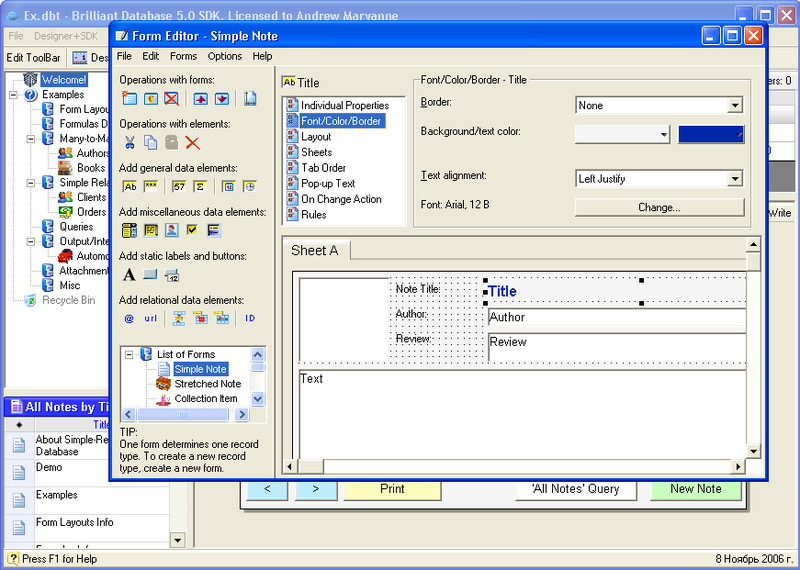 The Visual Form Editor is a landmark feature of Brilliant Database. This allows you to create a new database quickly and easily. You choose a required element from the element set and put it into the form. Here you can use lists, text, image or password fields, buttons and more. You can modify such properties as color, font, location, style or type, according to your requirements. 2. The Report Style Editor allows you to create output forms for visual representation when making a printout, such as Catalogs, Charts, Reports, Envelopes, Labels, Business Cards and more. 3. The Formula editor is a handy tool created to automate data processing. Using standard mathematical constructions, you can create a formula, according to which the necessary data will be calculated. 4. The Query Editor allows you to create and adjust queries for obtaining necessary information from the database. No special query languages are necessary. 5. The Export Designer can be used to create templates for exporting data (Web/HTML, integration with MS Word/Mailing software, etc.) 6. The Toolbar Editor allows you to customize and simplify your work with a database. 7. The Script Designer to automate routine calculations. Such database features as tree-like structure, relational structure, network support, attachments, sorting, import/export, backup, password protection (and more) are also supported.